Permeable paving helps project meet stormwater requirements. 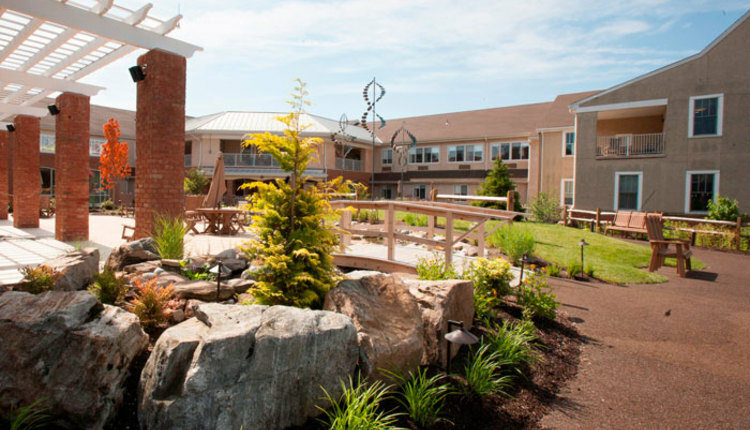 Meadowood Senior Living, Worcester, Pennsylvania, selected Design for Generations LLC, Medford, New Jersey, and Eric’s Nursery and Garden Center, Mt. Laurel, New Jersey, to design and develop a new multipurpose garden courtyard. They created a resort-style outdoor space that is striking in its beauty and engaging in its varied features and amenities. To meet local requirements for on-site stormwater retention, the courtyard includes 8,100 square feet of permeable pavement, installed with Porous Pave XL. Porous Pave XL, manufactured in the U.S., is a highly porous and durable paving material made with 50 percent recycled rubber chips and 50 percent aggregate mixed with a liquid binder.